Tom Wiggins was sold in 1850 along with his slave parents, Charity and Mingo Wiggins, to Columbus, Georgia lawyer, General James Neil Bethune. The new owner re-named the child Thomas Greene Bethune or Thomas Wiggins Bethune (according to different sources). Because the blind lad could not perform work normally demanded of slaves, Tom was left to play and explore the Bethune plantation. At an early age, he evinced an interest in the piano after hearing the instrument played by Bethune's daughters. By age four he reportedly had acquired intuitive, if rudimentary—and imitative—piano skills based solely on hearing. He continually intruded upon the Bethune family residence to gain access to the piano, with Bethune's daughters abetting these intrusions. Tom's father Domingo Wiggins, a field slave, and his mother Charity Greene were purchased at auction by James Bethune of Columbus, Georgia when Tom was an infant. Domingo and Charity's former master thought the blind sickly "pickaninny" had no labor potential and he was thrown into the sale as a no cost extra. Although Tom's parents were married, the prevailing custom of the time dictated that female slaves and their children retain the names of their owners. 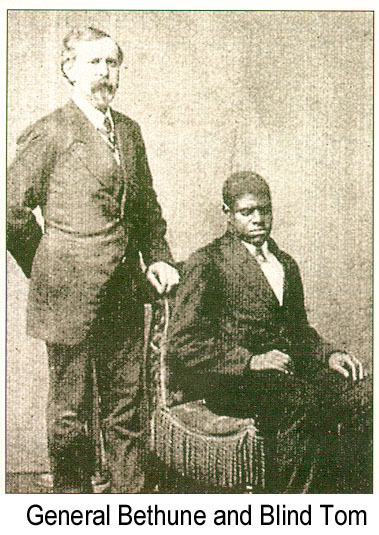 Following slavery tradition, Tom received the name Thomas Greene Bethune. Tom’s life was again spared, thanks to the tenacity of his mother. A few weeks before the auction, Charity approached a neighbor, General James Bethune, and begged him to save them from the auction block. At first he refused her, but on the day of the sale, the lawyer and newspaperman turned up at the slave mart and purchased the family.